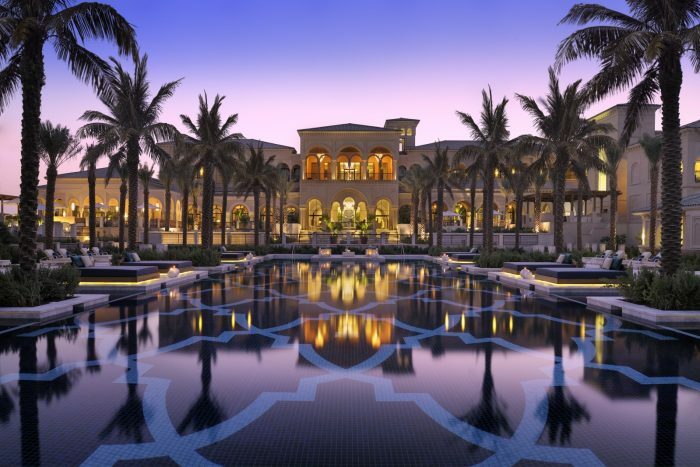 One&Only The Palm Dubai is an exquisite resort, with immensely luxurious surrounds; majestic gardens and scattered water features. The shimmering, exclusive marina makes One&Only Palm an enviable property to reside. The effortless chic of the 90 villas is flattering and the hint of Arabian architecture delicate. With state of the art amenities, you won’t want to leave your lavish villa, but the Spa awaits. Invigorating your senses in this cocooned tranquil retreat, the holistic treatments available are luxurious and relaxing. Your taste buds come to life with feasts from around the world, prepared by a Michelin starred chef and a sensual overwater urban 101 Dining Lounge. The exclusivity of the Kids ONLY club is a great place for children to stay entertained with the complimentary activities available. One&Only Palm Dubai is the epitome of splendor and a mystical paradise to make your Dubai holiday endlessly fascinating. The One&Only Private Spa has a holistic selection of tailored Spa experiences within a tranquil retreat setting amidst fountains, ponds and open courtyards. There are 9 individual Spa Suites available with private outdoor gardens. Treatments include The Palm Indulgence (3 hours) which is a Day Spa experience for two in the exclusive Rhassoul suite and include a 2 course lunch. An array of water sports are available which can be accessed via the One&Only Royal Mirage property, including Hobie Cats, sailing, water-skiing, kayaking, windsurfing, and if you fancy it even deep-sea fishing is available. Nearby attractions include world renown water parks and sailing activities. Relax on one of the larger than average daybeds or one of the 6 private cabanas by the 850 sq metre swimming pool. Fancy a stroll, try the private beach. One&Only Palm Dubai is a ravishing property with a foyer to take your breath away. Offering a truly unique stay, One&Only Palm consists of 90 stylish villas, each with a garden patio or private balcony to gaze into the sunset on your evenings, a captivating way to spend your honeymoon. The intimacy of the villa, with its slight Arabian touches, provides a spacious living space and the dazzling oversized freestanding bathroom is no less inviting. Surrounded by manicured gardens, you and your loved one are inevitably submerged into palmed terraces, ushered into private cabanas and can revel in the pool, as you soak up the sun. With many activities to partake in, including watersports, a gymnasium and golf, the One&Only Palm Dubai is a dazzling property that will leave you spellbound.